BRIGHTON, Mich - There was much anticipation in the months leading up to the release of the all-new Ford Mustang. Ford designers and engineers wanted to be discreet, proposing the question how will the all-new Ford Mustang remain a secret from paparazzi? A special design team was responsible for the camouflaging to keep the vehicle's shape under wraps. Debating the exact shape of the Mustang was one of the most talked about aspects by fans on the Internet. 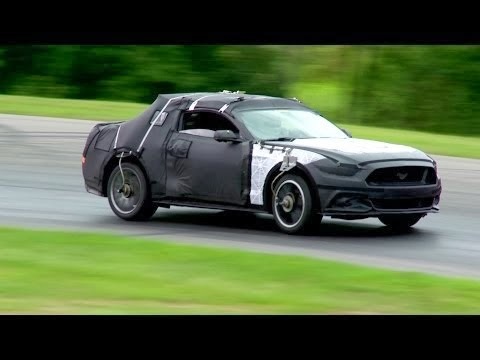 Fueling their assumptions, the Mustang development team logged tens of thousands of test miles on public roads during the summer and fall months without revealing the vehicle's shape. How to be able to do this, was the exact question the camouflage team from Ford design and engineering needed to answer. Professional photographers are all aware of where the cars are built and tested. If that wasn't difficult enough, smartphones with cameras and Internet connections make it almost impossible to avoid the public eye. Before any prototype was allowed to leave the plant, a camouflage package was developed and had to be approved by the design, engineering, and test track safety departments. The goal was even a great photograph would not give away the design details of the Mustang. The design team begins the camouflage process, then it is refined through engineering and safety. The first recommendation for camo for the Mustang was minimal in an effort to keep weight and aerodynamic effects to a minimum. The first and second camp packages showed too much of the profile and roofline. The third and final package made the Mustang appear more like a notchback and smaller than it actually was. Plastic and foam were strategically placed beneath the vinyl to hide lines of the car. When designing the camo, safety was just as important as security when testing prototypes. It was made sure that the car lights and signals were able to shine through the vinyl. Although photos were still snagged, the all-new Ford Mustang remained a secret from paparazzi. The world has now been exposed to this beautiful Mustang and engineers are free to complete final testing and development camo-free! Get your hands on your very on Ford vehicle at your local Southfield Area Ford Dealership. Brighton Ford is proud to serve those in Southfield and surrounding areas with the best selection of new, used, and pre-owned Ford vehicles! Visit us today and let us help you find the Ford you have been searching for.